The V.A. Belyi Metal-Polymer Research Institute of NASB (MPRI) has elaborated a new class of filtering materials — magnetic PFM [1-8]. 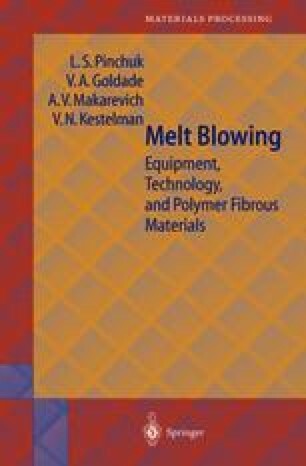 The technological base for manufacturing such materials is the melt blowing technique involving the following procedures: extrusion of a polymer melt filled by ferrite (barium or strontium) powder, fiber extension by gas flow, and fiber treatment in a magnetic field. The polymer melt is extruded through spinneret holes whose diameter far exceeds that of the filler particle. The thermal regime of spraying provides for cohesive bonding of the fibers on the forming substrate. The material is also textured during spraying. The final stage of magnetic PFM or finished FE manufacture is filler particle magnetizing in a permanent or pulse magnetic field.